Avui 23 de gener de 2019 fa trenta anys de la mort de Salvador Dalí. Today 23 january 2019 , thirty years of Salvador Dalí death. Aquest mati, he vist aquesta senyora de la neteja davant de l´ aparador on hi ha la foto de Salvador Dalí i no m´he pogut estar de fet aquesta foto. 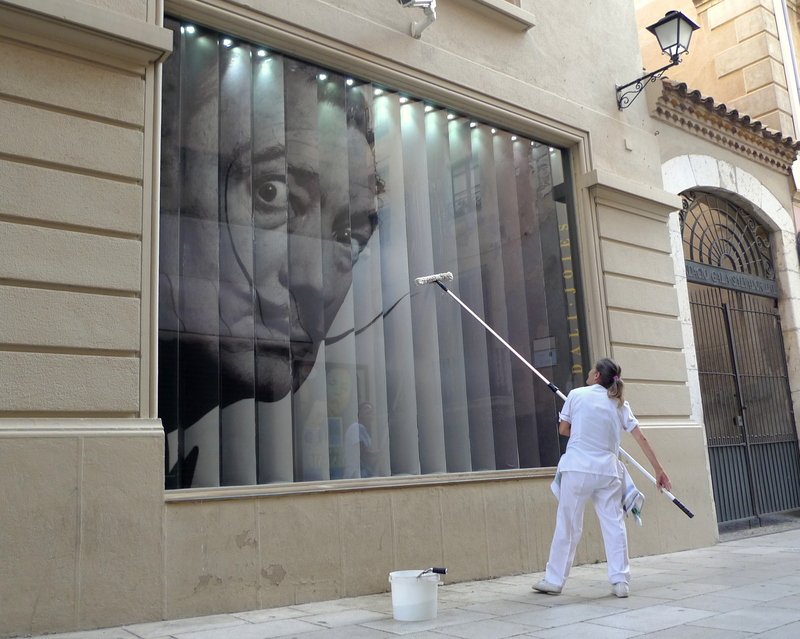 This morning I sow this lady cleaning the window where is a big Salvador Dalí picure, and I like to make a picture. 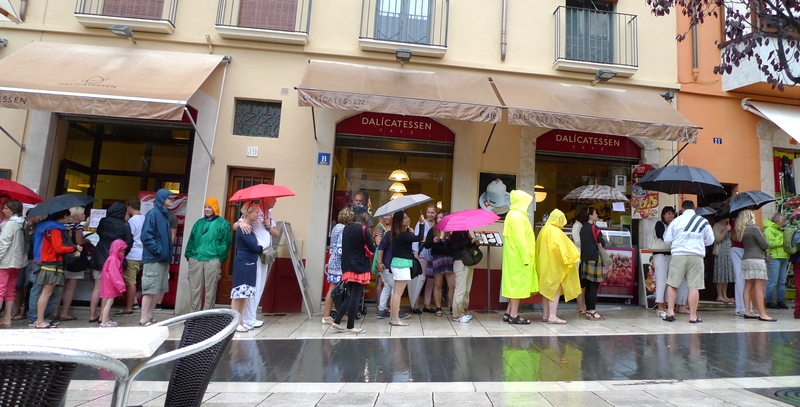 Aquest juliol 2011 està siguent atípic amb força dies de pluja i inestabilitat en el temps, venen molts visitants que opten per anar al Museu en comptes d´anar a la platja.Aquestes són un parell d´ imatges que tenim de la cua des de el nostre establiment. 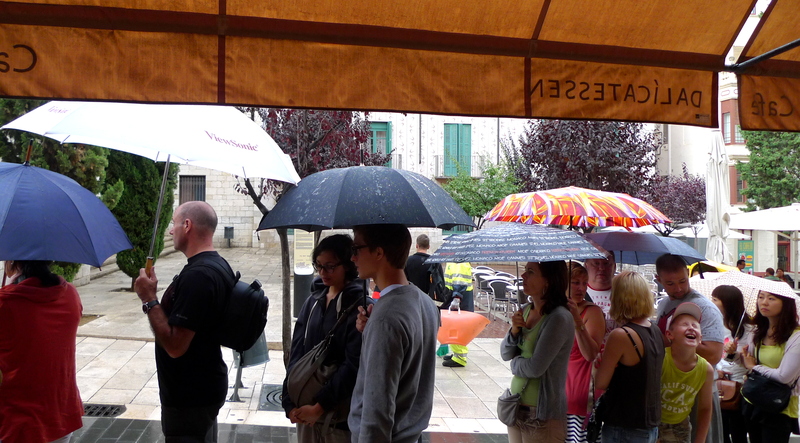 This July 2011 it´s been atípically wet and the weather is not so good, there is a lot of visitors , they choose to come to visit the Museum instead of going to the beaches. This is a couple of photos of the big line that we can see over our window. 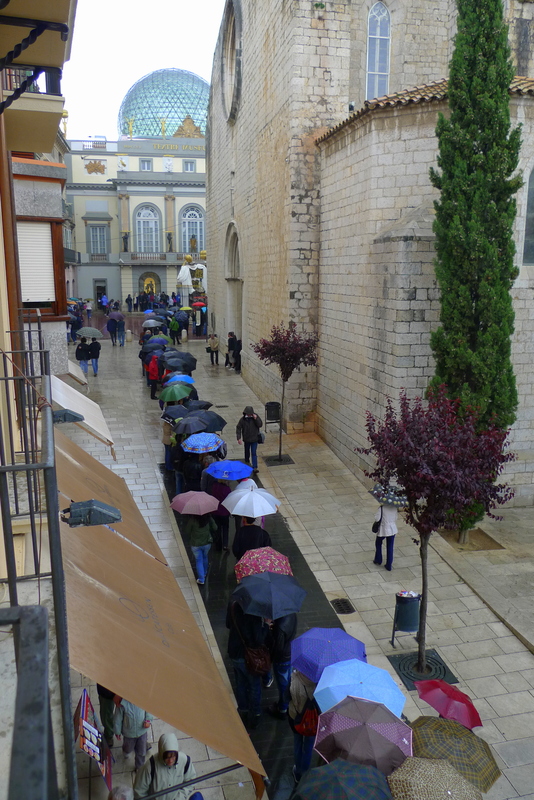 Aquest matí han passat per casa nostra unes noies molt guapes que estaben emocionades per fer la visita al Museu Dalí , prova d´aquesta il.lusió era el bigoti que s´han pintat. Hello to anyone we are preparing a new web, with new information , and a new blog with ultralocal information , thank you to for following us. Després de quatre setmanes d´intens treball, Dalícatessen ja ha tornar a obrir amb una nova façana, s´han recuperat els colors originals , estem molt contents de poder tornar-vos a servir. Us donem les gràcies per la vostra espera, sons moments difícils , però malgrat tot nosaltres intentarem aportar il.lusió a tots els nostres clients i amics. Aquest matí han començat les obres de restauració de la façana de la casa del carrer Sant Pere 19 on hi ha el Dalícatessen. Us demanem disculpes, per les molèsties, tornarem aviat i ben “guapos”. 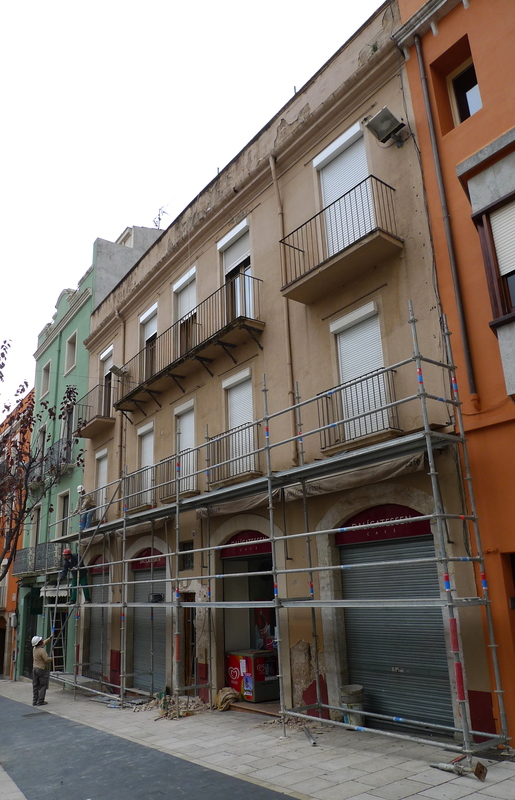 This morning we started the works on the main wall, fasade, of the house St Pere 19 street where is the Dalícatessen located. 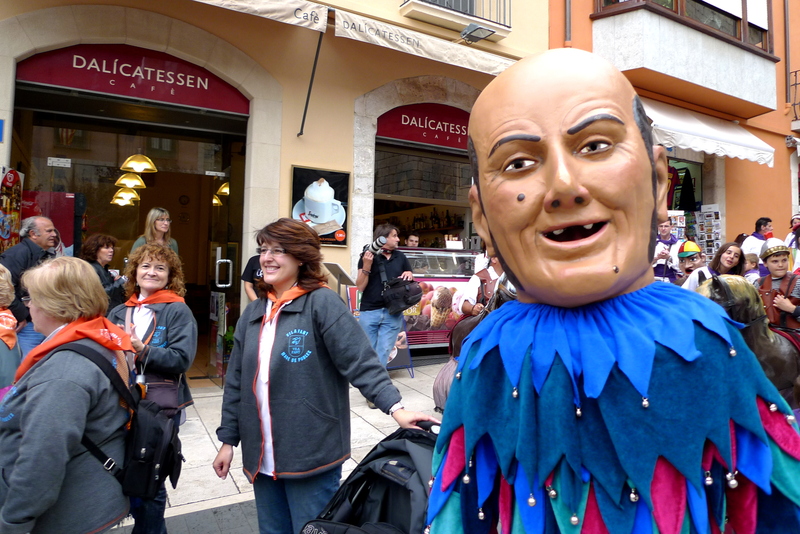 Article a la web Examiner.com on parla de Dalícatessen In Spain, approximately 80 miles north of Barcelona along the AP 7 (Auto Pista 7), you’ll find Figueres, the birthplace and resting place of Salvador Dali. 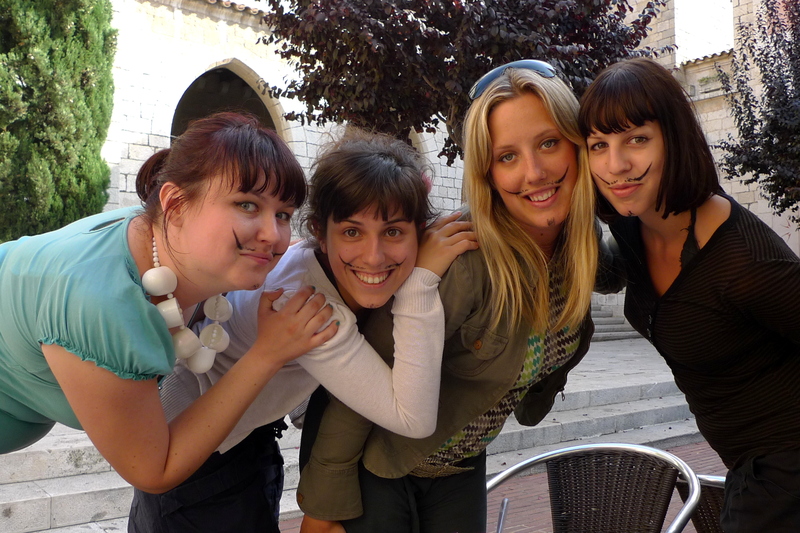 It is also the site of the Salvador Dali Teatro y Museo – which is definitely worth a visit. And even more enjoyable and less surreal is the (note the spelling) Dalicatessen. Located about 50 meters down the street from the museum, Dalicatessen certainly gets an “A+” for its super clever name. Priced at just over one Euro per cup, Dalicatessen scores way past the triple digits on its Café Cortado. Quite more satisfying than in a Dixie cup, the coffee is served in a small glass (ironically resembling the size and shape of said Dixie cup) by the friendliest barista/Café owner in Catalonia. Fluent in English, Marte is filled with that true Spanish passion usually found in their music and dancing – except his focus is on incredible coffee and warm conversations. Oh, Dalicatessen also has a lovely counter of fresh sandwiches, pastries and other Spanish yummies. Dalicatessen is welcoming, the bathrooms clean. 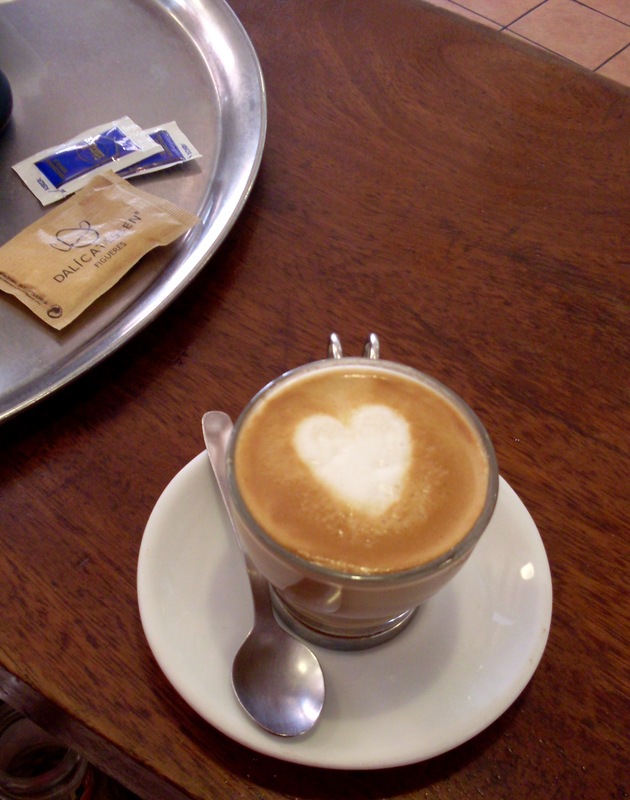 Whether you sit at the coffee bar, in a booth or outside admiring the façade of Salvador Dali’s baptismal church, you will undoubtedly enjoy the best Café Cortado that Spain has to offer. And when you go, tell Martí that Wendelyn sent you.